1, which starts from the corner piece play, since each sheet piles up to end without a pause. Therefore, short pile machine walking routes, convenient construction, the driven speed. However, because of the single block into easy to tilt to one side, the accumulated error is not easy to correct, metope straightness is hard to control. 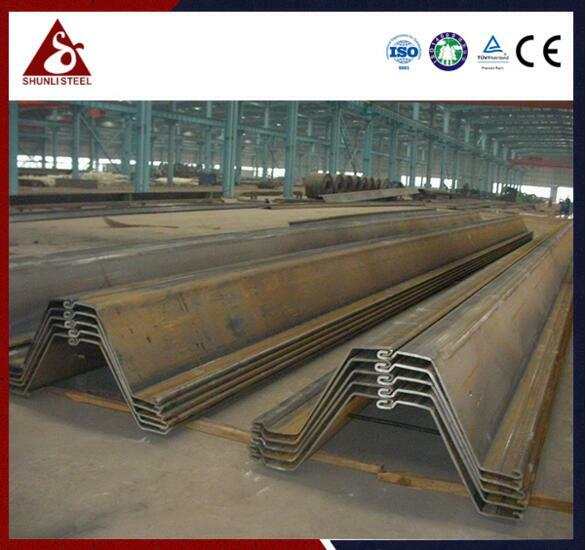 2, steel sheet pile construction to correctly select "screen type" piling method, the pile driving machinery and water period of division, so that after a sheet pile wall has enough stiffness and good waterproof effect, and the sheet pile wall straight, to meet the requirements of foundation construction, on the enclosed sheet pile wall also requires a closed meeting. 3, first set the axis of the cofferdam, by measuring personnel at regular intervals can set the guide pile, guide piles directly using the steel sheet pile, then hang a rope line as a conductor, piling, using wires to control the axis of the steel sheet pile, the axial normal demanding situations, using the guide frame. 4, single pile by continuous play, pay attention to the huge difference between pile top elevation is unfavorable. In insert measurement at any time during the process of monitoring slope is less than 2% of each pile, the timing when the deflection is too big can't use zazi method, lifting a pull. Deviation correction: when the steel sheet pile into such as tilting and the integration of a lock has space, at the end of the closed meeting there is deviation, profiled pile is commonly used in (on wide below narrow or wide width is greater than or less than the standard width of the sheet pile) to correct.